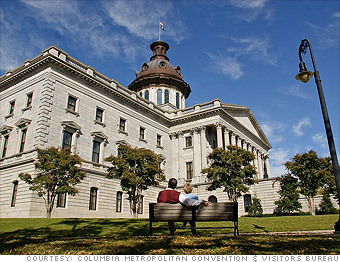 Columbia, S.C., boasts great weather for outdoor activities year-round. There are dozens of golf courses in or near Columbia. The city's three rivers, 12-mile greenway, and nearby Congaree National Park also provide ample opportunities to get outside. For indoor recreation, state residents age 60 and older can sign up for free classes at the University of South Carolina, or volunteer at the Columbia Museum of Art or South Carolina State Museum. There's also no shortage of performing arts organizations, including multiple theater groups, two ballets, and a philharmonic orchestra. Retirees here have a little more play money thanks to a $50,000 homestead exemption for homeowners 65 and older, a state tax exemption for Social Security income, and a deduction of up to $15,000 per person for qualified retirement income.